This proposal outlines a business model where the units thrive through a community supported, virtual association. I suggest a “Community Supported Association model” – a business model that is flipped from centralized, top-down management to a truly member-driven organization. 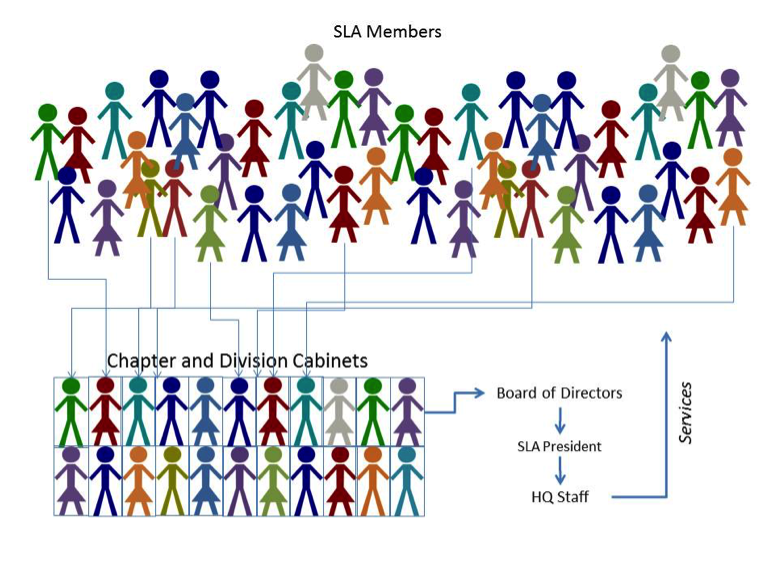 A central – but small – organizing body (SLA’s Board of Directors) collects information and desired outcomes from SLA members – like you and me – and determines WHAT the association should do. This central organizing body coordinates with the SLA headquarters staff that provides infrastructure and tools – the WHERE and WHEN – to achieve those outcomes. The units and members determine HOW to achieve those outcomes. Members of SLA are the final consumers of the services that SLA provides. We should ask them what they want and where, when, and how they are best able to use SLA’s services. Members are the WHO of SLA. Distribute funds to units for conference programming, networking, professional development, etc. Our SLA units are our core. Our divisions allow us to deepen our knowledge and skills in a subject area. Our chapters provide networking and learning opportunities locally. Our caucuses provide a path for new fields and ideas. Each of us brings our own lens to SLA, and these lenses form a kaleidoscope – not a telescope or a microscope. Let’s build an SLA infrastructure that will showcase our lenses – the subject and geographic richness that makes SLA valuable to each of us.